My best to you and your family at this special time of the year. May you enjoy some relaxing time with family and friends, and catch up on what the busy world may have caused us to miss over this past year. May you be blessed with good health and God’s Grace. May you welcome the Christ child with open arms and be a shining example for others to follow as you live our motto. And may the new year bring us closer to one another, and allow us to agree to disagree at times, but always treat each other with respect and dignity. A very Merry Christmas and Happy New Year to all. I look forward to a great 2019! A very grand welcome to our newest member, Thomas Moriarty of New Windsor, who was initiated at the November meeting. Make Tom feel welcome the next time you see him at the Hall or in the neighborhood. We ask for your continued prayers for Brother Jack Green who is in the VA hospital in Montrose, and Brother Tom Quinlan who is recovering from an illness. Congratulations to Brothers Michael O’Keefe and Tim Allen on their recent selection as parade aides. O’Keefe will represent Orange County as aide to Grand Marshal Dr. Brian O’Dwyer, Esq. in the NYC St. Patrick’s Day Parade on March 16th, and Allen will represent Division 2 in the Mid-Hudson St. Patrick’s Parade on March 10th. More information to follow, but we wanted to announce their selection and recognize each for their steadfast support of the Division and the Irish American community in Orange County and beyond. As we approach Thanksgiving, we should all take a moment to reflect on the journey our ancestors took when they left the shore of Ireland. Some arrived here via Canada, others directly to NYC, and others through a more circuitous route. However they arrived, I am thankful that their journey and that of my ancestors allowed you and I to come together and be part of the wonderful Division we have. We have an entertaining night of country and Irish music on the schedule and a delicious Irish breakfast on the menu. Take part in a little or a lot of what we have to offer and give thanks to those who came before us and paved the way for the truly good life God has bestowed upon us. My blessings to you and your family this Thanksgiving. iWed Nov 14 Division Meetng - Hall: 7 pm. All members encouraged to attend.NOTE THE DATE CHANGE!! Sat Nov 17 Irish Country Night - Hall: 7 pm. Music by the Parting Glass. loved ones: All day long. Quarterly Meeting - Division 1: 2 pm. We were honored to receive word that Division 2 was one of just eight Divisions in the United States to receive the 2018 Chieftains of Charity Award from the National Board of the AOH. The award acknowledged divisions that perform exemplary works of charity and mission in the community and beyond. A special thank you to each member, family member and friend of Division 2 who helped in any way to support our efforts. Perhaps you delivered Christmas dinners to local families in need, provided clothing for veterans at Castle Point, supported a Friday night BBQ, donated items for a raffle basket, or helped run a children’s holiday party. For all those who helped us achieve this distinction, thank you so much! Sun Sep 9 Irish Breakfast - Hall: 9:30 am - Noon. Hall: 1pm. For members and families. Sat Oct 13 $50 Raffle Drawing - Hall: 1 to 5 pm. Thank you to all members who participated in the St.
gloves and balmoral so you are prepared for next year. and the veterans pin ceremony this month. remember our Irish ancestors who made their journey. century. Still, some members are themselves immigrants. activities that celebrate our Irish heritage. Jan 13 The Blow Ins Concert - Hall: 7:00 pm. drink ticket, snacks and great music! Jan 28 Major Degree - Schenectady: Noon. Stout Pub, W. 33rd St. NYC: 10:30 am. A Message From the Division President Brothers, On behalf of the officers of Division 2 I wish you and your family a very peaceful, happy, merry and safe Christmas and New Year. Despite what we see on television each day, we are truly fortunate to live in a land that allows each person to speak freely and express their views. We owe much of this fortune to our ancestors who traveled to America as immigrants, sometimes not welcomed by those who came before them, and chose to serve and protect this great nation. Any member who is a veteran is urged to notify us so that we can properly honor you as noted on the reverse. Peace to all and blessings for a great 2018! Dec 10 - AOH Orange County Board Quarterly Meeting - Division 1: 2 pm. Members encourage to attend. Dec 17 - Children’s Christmas Party - Hall: 1 to 4 pm. Dec 20 - Division Meeting/Officer Installation - Hall: 7 pm. All members encouraged to attend. Dec 25 - Merry Christmas! Warm wishes to you and your family. Jan 1 - Happy New Year to All!! Jan 13 - The Blow Ins Concert - Hall. The weeks ahead will be very busy as we host a number of important events at our Hall. I encourage you to participate in as many as possible to show the strength of our Division. Thank you to everyone who supported Sinead with good wishes and prayers as the New York Rose. Sixty-four participants, two weeks of non-stop travel across Ireland, countless hours being a great ambassador for the Rose of Tralee Festival, and a fine example of New York pride. What a wonderful experience! My family thanks you very much. Happy New Year to you and your family. It is my sincere hope that 2017 brings happiness and prosperity to all. As we approach the January 20th presidential inauguration, let us not forget that we either descended from immigrants to this great country, or emigrated ourselves. I pray that the Irish immigrants of the future, who will cross the Atlantic for many of the same reasons as the 5 million Irish who made the journey since the early 19th century, will have the same opportunities as our ancestors. Division 2 will be here to support them as they continue their journey. The current board of officers for the Division was reelected at the December meeting and will be installed at the January 18th meeting. Let’s thank them for their time, effort, and devotion to the Order and its ideals. Please continue to keep Brother John Gehler in your prayers as his health continues to fail. Thank you to Kim, Pat and Dennis Malone, and Chris and Marge Sherwood for a fabulous children’s Christmas party. The packed event helps to reinforce our commitment to family. Thanks to …John Encke and Stop & Shop for their generous donation of 52 turkeys for the Christmas dinner donations. Thanks also to Bill Kirnan and John Greehy for leading this annual holiday effort, and to everyone who helped distribute the food. “Helping Hands” on the envelope. Sun Jan 8 Irish Breakfast - Hall: 9:30 am - Noon. Wed Jan 18 Division Meeting - Hall: 7 pm. All members encouraged to attend. Sat Feb 11 Chili and Irish Soda Bread Cook-off - Hall: 2 pm. All are welcome. Wed Feb 15 Division Meeting - Hall: 7 pm. All members encouraged to attend. Fri Feb 17 Pub Trivia Night - Hall: 7 pm. Teams of 4 ($5 per team) compete for bragging rights. Airport. Come in honor of those flying that day or in honor of someone no longer with us. There will be plenty to do over the next two months so plan on coming out to the many events noted in the newsletter and on the website. We would love to have more members march in both the NYC and Mid Hudson St. Patrick’s Parades. Parade uniform is a must to march (black pants, white shirt, black tie, black socks and shoes, balmoral hat and green Division jacket). There are extra jackets at the hall that you can borrow. The Division is planning a bus trip to New York City on Thursday, November 19th to visit the Irish Hunger Memorial (http://bpcparks.org/whats-here/parks/irish-hunger-memorial) and National 9/11 Memorial (http://www.911memorial.org). The bus will depart the parking lot of the Hall at 10 am and bring you to lower Manhattan. First stop will be the Hunger Memorial, then the 9/11 Memorial. There will also be time to stop and have something to eat. The cost for the bus and admission to the 9/11 Memorial is $50. Coffee and donuts will be provided at the Hall before we leave. Since the 9/11 Memorial tickets sell out quickly, we ask that you contact John Greehy (845-857-5177) as soon as possible if you would like to attend. Pre-payment is necessary. Welcome to fall, a wonderful time of year in the Hudson Valley. Come sit on the deck at the Hall on a Friday night and enjoy some food, drink and fellowship. I ask all of our members to help make the first-ever $50 raffle a success by helping to sell tickets and coming to the Hall on the 26th. We continue to look for qualified candidates to become members so please speak to your friends and relatives and encourage them to consider membership. Please pray for our fellow Brother Bill Moore who passed away on July 28th. Please also pray for Bill’s family that they may be comforted in their time of sorrow and that they may one day be reunited with Bill. dessert, snacks…). Donations accepted for dinner with all proceeds donated to our local churches. Please introduce yourself and help them to feel at home. Sep 13 Irish Breakfast - Hall: 9:30 am - Noon. Sep 13 AOH County Meeting - Hall: 2 pm. Sep 16 Division Meeting - Hall: 7 pm. All members encouraged to attend. 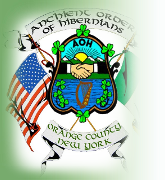 Sep 19 AOH/LAOH County Board Halfway to St.
Patrick’s Day Picnic - Our Hall: 1 to 6 pm. Sep 26 $50 Raffle - Hall: 2 pm to 5 pm. Good Spring to all members and their families. I hope you had a wonderful Easter. Now that the Hall is serving dinner on Friday nights, I hope to see many more of you there with family and friends. If you have yet to get your building fund raffle tickets, do so quickly! They always sell-out. Your assistance is needed at the AOH County Convention or spring cleanup; pick one and come out and lend a helping hand. Enjoy the nice weather and check out the calendar for upcoming events. Mar 16 Orange County AOH Convention – Division 1 Hall, Monroe: 10 am. May 20 Division Meeting - Hall: 7 pm. All members encouraged to attend. May 23 Hall and Grounds Clean Up - Hall: 8 am. Spring cleaning. All are welcome. Jun 20 Building Fund Raffle - Hall: 2 pm to 5 pm. Ticket holders admitted free. Others $25 p/p. Welcome to March!! As we look forward to the warmer weather and the departure of the snow, we also join together to celebrate our faith and heritage. There are many ways to show your Irish pride this month so consider joining us at one and marching in one of the parades (dress uniform required, but we should be able to provide some items you may not have). March is also a great time to invite a friend to the Hall or the next Irish breakfast to see what we are all about. That friend just might become our newest member. Enjoy the friendship, unity and Christian charity that our organization was founded on.